This system is unstable and Discrete PID Controller Block's autotuner cannot find Kp, Ki, Kd to stablize the system. I want to design a PID Controller, not another Controller. How can I design the PID Controller in Matlab and Simulink? It can be designed? Thanks for read my ask. From here, it should be clear that a simple controller, K(s) = P+D*s+I/s, cannot stabilize the system (hint: routh-hurwitz stability criterion). That's why your controller needs to have a term that will show up as the s^3 term. This controller stabilizes G(s), and also places all 4 of the closed loop poles to (-4+0i). Another method to tune the gains of your controller is to perform Ruth-Hurwitz stability analysis and determine the range of controller gains that achieves closed loop stability. These calculation are done for continous time however they are valid for discrete time as well, with some modification due to conversion from s to z domain. Thanks for your Help SO MUCH Aquatris! Keep in mind selecting the poles is important since it will determine the performance of your controller, or in other words the response of your closed loop (overshoot,settling time etc.). Thank you but Can I ask you one more question? I got P, I, D and C what I hoped as you said me, and It works in continuous time model. but it do not work for same Controller(PIDC Controller). 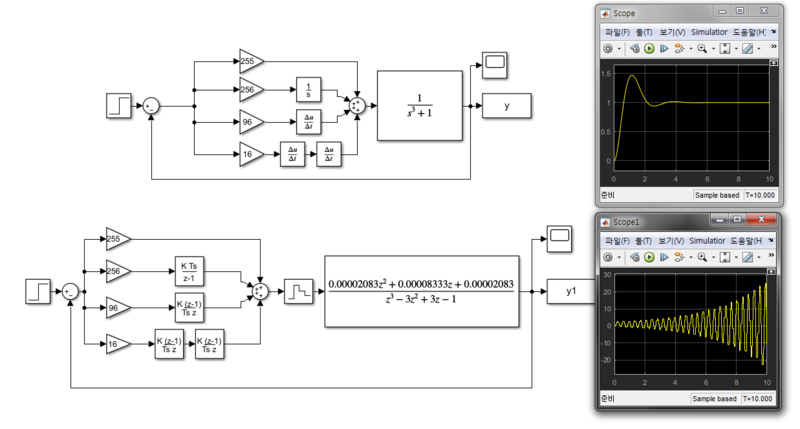 I use SImulink, but I can't what is wrong. This picture is the continuous and discrete plant and output. In discrete plant, sampling time Ts is set for step input parameter. I recommend you do do same thing I did for continous system for the discrete system. You know your G(z) and you can parametrize your K(z). Then obtain your T(z) and select some stable poles (z(1,2,3,4) = 0.8 for instance) and try to find controller gains that gives you the same charasteric equation polynomial coefficients.